On Monday at GAHS, senior Hunter Copley signed her National Letter of Intent to join the Transylvania University softball team. Sitting in the front row, from left, are Michelle Copley, Hunter Copley, John Copley and Chelsea Copley. Standing in the back row are GAHS athletic trainer Lori Ward, Blue Angels softball coach Scott Stanley and Gallia Academy golf coach Mark Allen. 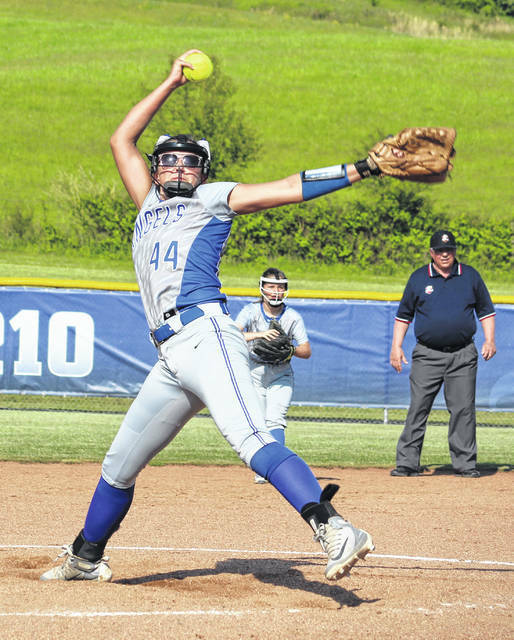 CENTENARY, Ohio — Most pitchers look to avoid bats, but then again, she’s not most pitchers. On Monday in the Gallia Academy High School library, senior Hunter Copley signed her National Letter of Intent to continue her pitching career with the Transylvania University softball team, referred to as the Pioneers, but represented by a bat mascot. Copley — who will begin her senior campaign with the Blue Angels this March — talked about the opportunity she’s been given to play softball at the next level, and follow in the footsteps of her sister Chelsea, a 2015 River Valley graduate playing her senior softball season at the College of Wooster. Copley has 37 pitching victories and 260 career strikeouts in her three seasons with the Blue Angels, going 13-4 as a junior. She’s also helped her own cause plenty of times, recording 98 hits so far. As a freshman, Copley was named to the first team on both the Ohio Valley Conference and Southeastern Ohio Athletic League all-league teams, while finishing as an all-district second team selection. As a sophomore, Copley helped the Blue Angels capture a sectional title, and was named to the All-OVC first team and all-district honorable mention list. In her junior year, the Blue and White repeated as sectional champions and claimed a share of OVC title for the first time in school history. Copley was named to the All-OVC team for a third straight season and was an all-district second teamer. GAHS head coach Scott Stanley is looking forward to having his ace for another season, and believes her hard work will carry her at the next level. Transylvania University is a Division III school located in Lexington, Kentucky, and the Pioneers compete in the Heartland Collegiate Athletic Conference. Along with her academic goals, Copley will look to compete for a pitching spot on the Pioneers, who were 34-9 last season. Softball is one of four sports Hunter has excelled in at GAHS. She’s a two-time all-district selection on the Gallia Academy volleyball team, which has won four straight sectional titles and and five league championships in four seasons. Also a four-year member of the basketball team, Hunter was an all-district performer, with a career-high of 34 points in a victory over Point Pleasant earlier this winter. A two-year member of the GAHS golf team, Copley helped make school history this past fall, as an all-district first teamer on the Blue Angels’ first-ever state qualifying team. Hunter — who holds a 3.91 grade-point-average, good enough for 14th in the GAHS Class of 2019 — is the daughter of John and Michelle Copley of Bidwell, Ohio.